CubaSi - Vancouver, Montreal, Ottawa and Kiev hit the streets to demand: Hey Trump! Lift the Blockade on Cuba Now! Vancouver, Montreal, Ottawa and Kiev hit the streets to demand: Hey Trump! Lift the Blockade on Cuba Now! For over 56 years, the Cuban people have been enduring an unjust U.S. blockade, which has negatively impacted their daily lives. One example of the cruel effects of the blockade is the damages caused to the Cuban healthcare system. In this sector alone, the monetary damage is estimated at more than $87 million just in one year. Despite all these challenges and obstacles by the Unitec States, Cuba is world renowned for its universal health care system, which has achieved a lower infant mortality rate than many first world countries, including the United States and Canada! On December 17, 2014, former U.S. President Barack Obama and former Cuban President Raul Castro made the historic announcement that they would be moving towards normalizing relations. Although positive first steps were made towards lifting the U.S. blockade on Cuba, this progress was stalled under the Obama administration. Now the Trump administration has made efforts to turn back completely the progress made. Here in Vancouver, after the 2014 announcement Cuba solidarity activists mobilized to protest the U.S. blockade, knowing that a big push of public opinion was needed to keep this momentum going in the right direction. 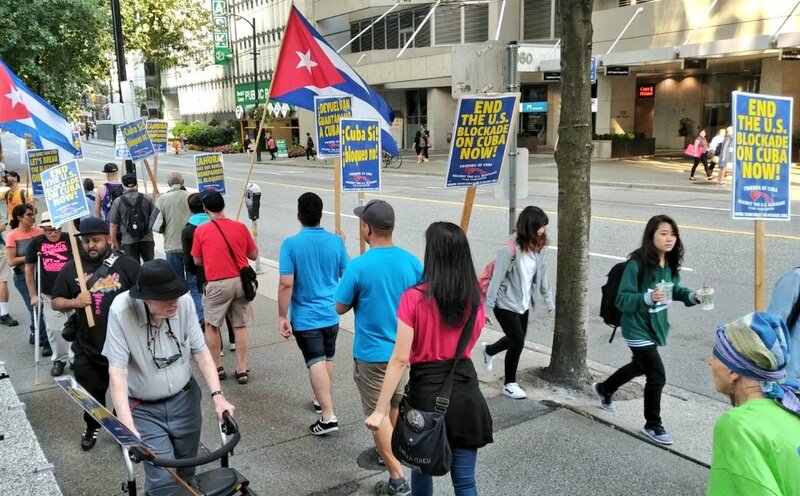 Friends of Cuba Against the U.S. Blockade – Vancouver (FCAB-Van) was formed and started organizing monthly picket actions in front of the U.S. Consulate in downtown Vancouver. Vancouver is now joined by Ottawa and Montreal, Canada and Kiev, Ukraine in united and coordinated monthly actions against this criminal and unjust blockade and demanding that the U.S. return the U.S. occupied territory of Guantanamo to Cuba! In Vancouver on August 17, 2018, Cuba solidarity activists and their supporters marched in front of the U.S. consulate holding picket signs high and chanting “Hey Trump, Lift the Blockade!” and “Return Guantanamo to Cuba Now!”. Between rounds of picketing, the protesters gathered together to hear from local speakers, as well as to hear a phone message of solidarity from Ottawa Cuba Connections, who also protested that day in front of the U.S. Embassy. To wrap up the action, protesters gathered together for a photo in front of the U.S. Consulate doors, proudly holding a banner reading “End the Blockade of Cuba!” This photo was shared on Twitter and Facebook around the world to spread the word that supports for Cuba and protest against the blockade is alive and well here in Vancouver!